Pen Pals & Picture Books: Avast Ye Landlubbers!! First off, I know me mate David Shannon would sooner walk the plank than put his name on a book fit for keelhauling! So, ye can be assured this here belongs in the treasure chest. The tale tells of our lad Jeremy Jacobs and how he becomes a buccaneer for a time. Jeremy revels in the raucous pirate ways, but he soon longs for the fineries home (like goodnight kisses). 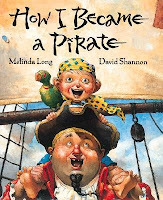 It's a sweet swashbuckling story sure to make any little lad or lassie grin. So ye best weigh anchor, hoist the mizzen, and get to readin' this book! Ye savvy? I recently picked up the sequel to this book- it was also awesome.